Caffeine stimulates the central nervous system and it is often consumed to feel more awake and alert. It can have several effects on the body, including altering the breath rate, which may be a concern especially for those with lung disorders. If there are concerns about caffeine use, the first step is to speak with a health care provider who can advise on caffeine intake based on personal health. Caffeine is a substance that is found in beverages such as coffee, tea and sports drinks, some foods such as chocolate and in certain medications. 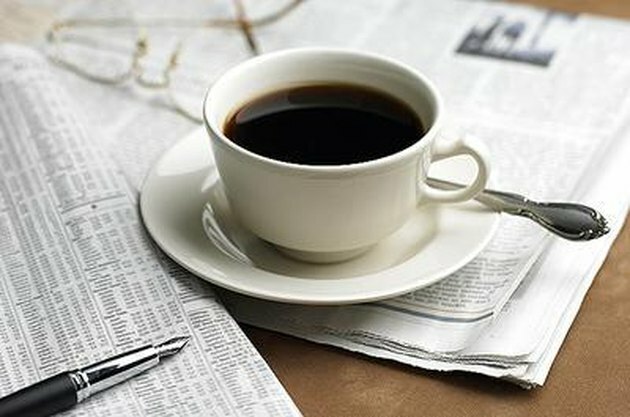 For most, consuming about two to four cups of coffee a day poses no health problems, states the Medline Plus website. Since it does stimulate central nervous system activity, it may affect breathing in some patients. Everyone responds to caffeine differently and for some, just one cup of coffee can have negative effects. Each individual needs to experiment to find what amount is safe to consume. According to the Nemours Foundation, caffeine creates feelings of alertness by increasing nervous system activity which in turn, speeds up the heart rate and rate of breathing. As the heart beat and breathing rate quicken, more blood and oxygen are delivered to the body. This increase in blood and oxygen helps to provide a boost of energy. In addition, caffeine acts as a bronchodilator. A bronchodilator is a substance that dilates the the passages that air travels through. Bronchodilators also cause the respiratory muscles to relax. Both of these effects create less resistance in the airways, which in turn increases airflow to and from the lungs. However, caffeine even in small amounts can also cause irritability, nervousness, trouble concentrating, difficulty sleeping, anxiety, breathlessness and many other symptoms. In addition, some can become dependent on caffeine and experience withdrawal symptoms when trying to stop or cur back. COPD stands for chronic obstructive pulmonary disease and it is general term for any condition that causes difficulty breathing. This includes asthma, bronchitis, emphysema and others. When it comes to treatment, COPD requires a multidisciplinary approach that includes dietary changes. Eating a healthy, well-balanced diet should be combined with limiting caffeine intake, reports the Cleveland Clinic. Since caffeine increases breathing rate, it may place to much stress on the heart and lungs for those who already have trouble breathing and this can worsen symptoms. In addition, caffeine can negatively interact with medications being taken to treat COPD. If breathing problems occur with caffeine use or if it is making symptoms worse, a physician may recommend cutting back or eliminating intake. However, this must be done slowly to avoid withdrawal symptoms such as headaches, fatigue, irritability and nervousness. To reduce intake gradually, try making a cup of coffee with just half caffeinated coffee and half decaffeinated. Slowly decrease the amount of caffeinated coffee in the cup until it is purely decaffeinated. Slowly reduce daily consumption of coffee or soda by cutting out one cup of coffee or one can of caffeinated soda each week. It is also important to review medications with a physician, as some may contain caffeine.